Page 3 covers older models D3LCC, D3LC, D3L. Page 4 covers older models D5LC, D5L, D4L. Manufactured 2003* onwards, current model. Automatic settings Boost High Med Low Standby. Heat output 2200 1800 1200 850 0 watts. Fuel consumption 0.28 0.23 0.15 0.10 0 l/hr. Exhaust outlet pipe 24 mm. Links for downloading manuals see Manuals page. Wiring connection details see Wiring page. Ducting information see Ducting pages. Full servicing information see Airtronic Service pages. Fault finding information see Faults pages. 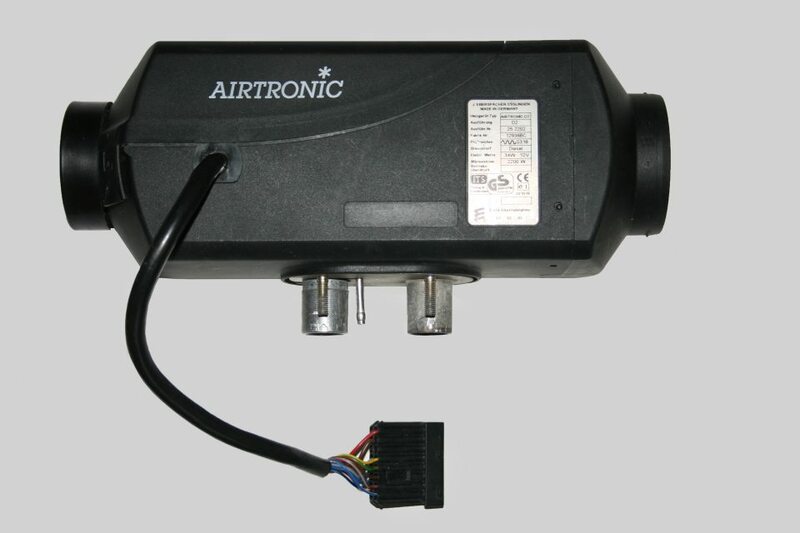 Heat output 4000 3000 2000 900 0 watts. Fuel consumption 0.51 0.38 0.25 0.13 0 l/hr. Length 376, Width 140, Height 150 mm. Combustion air inlet pipe 25 mm, Exhaust outlet pipe 24 mm. Higher heat model of the D2 with similar construction. Airtronic D4 Plus - Larger motor and fan blades for longer air heating pipe runs, different ECU. Slower fan speed for lower noise, different ECU. Manufactured 2005* onwards, current model. Heat output 5500 4800 2700 1500 0 watts. Fuel consumption 0.75 0.65 0.37 0.27 0 l/hr. Length 530, Width 170, Height 185 mm. 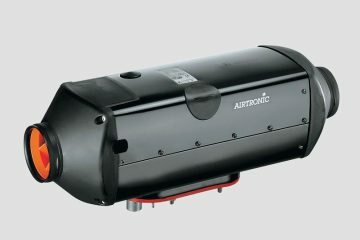 The Airtronic D5 construction is significantly different from the Airtronic D2 and D4 models as it is an updated older D5LC design. Heat exchanger, glow pin and screen are D5LC type. Essentially it is the D5LC body fitted with a new ECU and the separate sensors replaced by a combined sensor. 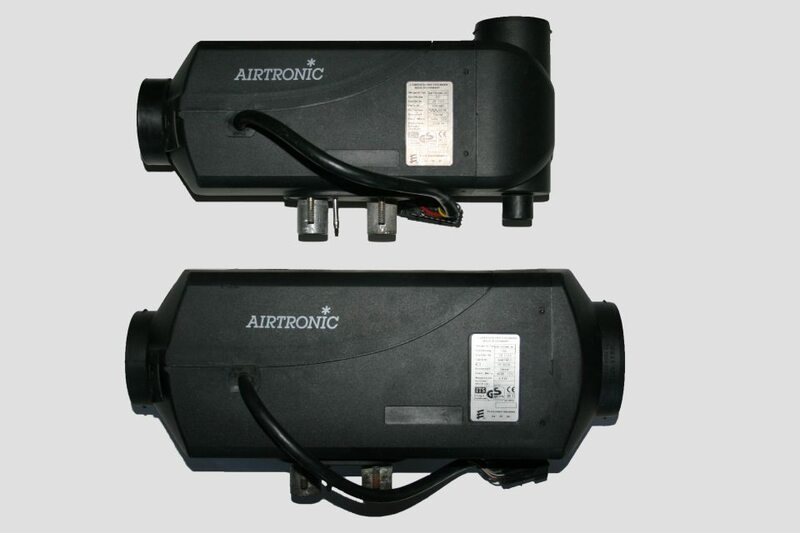 It does not have the lower start current advantages and the easier servicing of the other Airtronic models. Higher start current needs thicker power supply cables. The smaller grommet on the upper case gives access to a rotary valve which is in the combustion air feed to set the fuel mixture. Treat it as a factory setting and leave alone unless a gas analyser is available. Spare parts availability Current model. 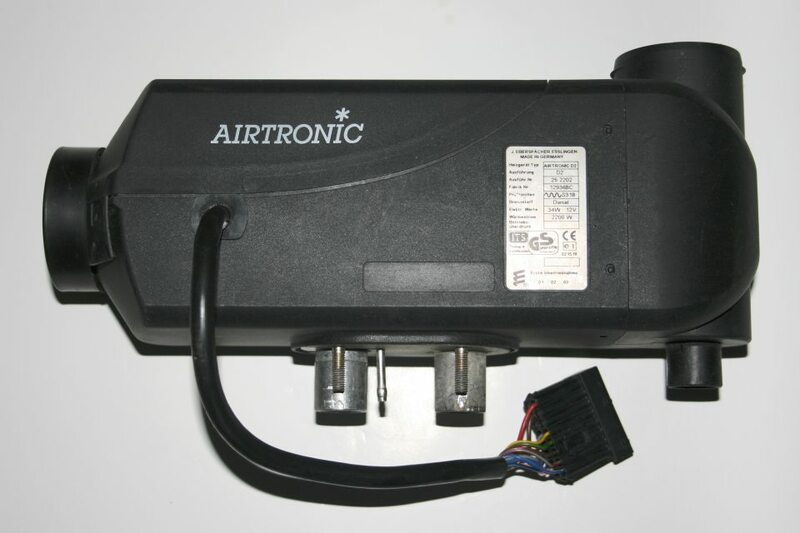 Servicing details for the Airtronic D5 differ from the other Airtronic models and are included on our servicing pages. Photographs showing each stage during servicing would be welcome for including on our site. 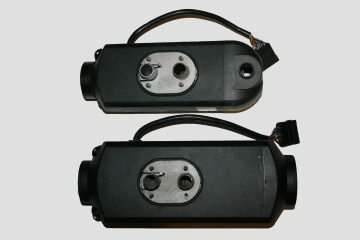 Eberspacher current diesel heater models with brief details, for older models see the other pages. * Dates are a general indication only, nearly all are very much best guesses as date information is not published. The data is a quick guide for users buying second hand heaters, check with the Eberspacher manuals if it is critical. 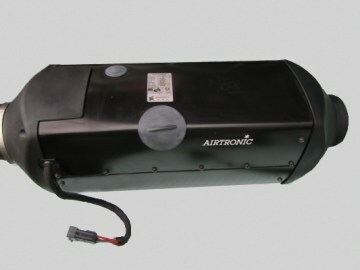 Models are produced in 12 or 24 volt versions. The highest heat models are not included. Read our Buying advice page before buying to avoid very expensive mistakes like non standard heaters. Eberspacher D2 and D4 heaters together to show size differences. D2 uppermost. Airtronic D2 fitted with a right angled hood. This can also be fitted sideways or upside down. Note that fitting a right angled hood will significantly reduce the permitted ducting length & fittings allowance. Hoods from other models will not fit, even if similar size. Heating air inlet left, Heated air outlet hood right. Bottom:- Combustion air inlet, Fuel inlet, Exhaust outlet. The Airtronic D3 heater model is not sold in the UK. It is a de-tuned Airtronic D4 with a slower motor speed, it was designed as a quieter heater for campervans. They only have a duct rating factor of 3m, so not normally used in boats. 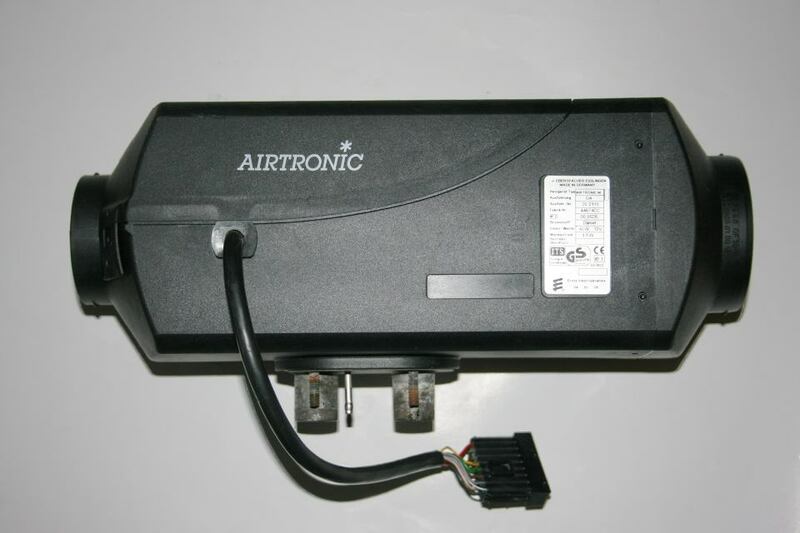 The parts are all the same as the Airtronic D4 except for the ECU. 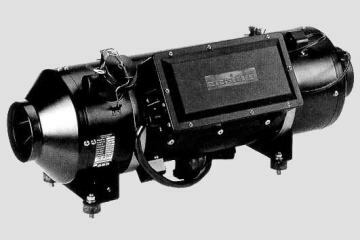 The D8LC is only included here to show higher heat versions are available. Generally these are fitted to larger boats / busses and would presumably be professionally installed & maintained. Construction is significantly different from Airtronic models. The 7 day timer manual mentions its output needs a relay fitted as the D8LC carries a load on the switch wire, this presumably will apply for all controllers. The reason for having this site is to promote our Le Tonkinois natural varnish and Flexidisc sander products, we hope you will look at those pages as well as these.